But the after-bath snuggles were great! The head massage was the best. After grooming, her skin had more space to heal. The finishing touch: a pretty blue cone to keep her skin safe from scratching! Nimbus used to live on the streets, trying to take care of herself. 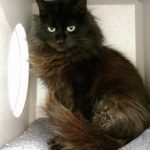 But this sweet senior kitty wasn’t suited to life as an alley cat! When she arrived at SAFe Rescue for help, Nimbus was truly a sorry sight. Her teeth were loose. Her paw and her tummy were wounded. Her long coat was infested by fleas and bugs. Nimbus had a long road to recovery ahead of her. She got spay surgery, Epsom salt soaks for her wounded toe, and antibiotics for her infected tummy. Dental surgery made her a member of the “Four Tooth Club,” but removing all of her damaged teeth definitely left her feeling more comfortable. She As a shy girl, Nimbus also started the Jackson Galaxy’s Cat Pawsitive behavior program. At first, she was so timid that she wanted to get as far away from people as possible. Her clicker training reward for not growling was for her handler simply to turn away from her and leave her alone. Little by little, her sweet personality began to emerge. Now she even prefers pets and attention as her reward! Even after all that TLC, though, Nimbus still wasn’t feeling completely comfortable. She needed… a senior kitty spa day! Although the infestation in her coat had been treated, it left her with irritated, itchy skin. Nimbus needed a lion cut to let her skin heal and breathe. Alissa Rose of Seattle Mobile Grooming kindly volunteered to visit the rescue to help Nimbus. This morning, it was spa time! And it will grow back even more gorgeous than ever! Do you know someone who might have a place in their heart for sweet Nimbus? Please share her story and help her find a home! You can learn more about making Nimbus your new best friend on our adoptions page. She is a doll. Thanks for rescuing her.